New research reveals that children born to women with rheumatoid arthritis face an increased susceptibility for certain chronic diseases. The findings, which appear in Arthritis Care & Research, should be used to increase awareness among paediatricians and general practitioners. Pregnant women with rheumatoid arthritis may be concerned that they might pass rheumatoid arthritis or other related diseases on to their children. To look into the issue, Line Jølving, MHS of Odense University Hospital, and her colleagues conducted a nationwide study with long-term follow-up of all children born in Denmark during a 25-year period. This included 2106 children born to women with rheumatoid arthritis, and 1,378,539 children born to women without rheumatoid arthritis. 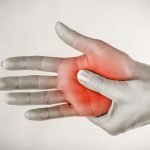 The researchers found that the risk of being diagnosed with several diseases in childhood and adolescence increased when the mother was diagnosed with rheumatoid arthritis before pregnancy. Specifically, the presence of rheumatoid arthritis during pregnancy was linked with a 2.2-times increased risk of thyroid disease, a 1.6-times increased risk of epilepsy, and a 2.9-times increased risk of rheumatoid arthritis in offspring. ‘We have addressed a concern in pregnant women with rheumatoid arthritis in terms of a potential increased risk of a negative impact of their chronic disease on the future health of their offspring,’ explained Jølving.